Energy prices drove overall inflation up sharply in March, giving a boost to the I Bond's variable rate calculation. I Bonds purchased before May 1 will offer an overall one-year return of 2.4%, but most importantly will carry a permanent fixed rate of 0.5%. My advice continues to be: Buy I Bonds up to your full allocation before the fixed rate is reset on May 1. U.S. inflation surged a bit in March, the Bureau of Labor Statistics reported today, providing the final piece of data needed to set the new inflation-adjusted variable rate for U.S. Series I Savings Bonds. The BLS set the March index for non-seasonally adjusted inflation at 254.202, an increase of 0.56% over the February number. The I Bond's new variable rate, which will go into effect May 1, is based on non-seasonally adjusted inflation from September 2018 to March 2019. Because inflation increased 0.70% (rounded from 0.698%) over that period, the I Bond's new variable rate will be set at 1.40%, boosted by two recent months of relatively strong inflation. But that is still lower than the current annualized rate of 2.32%, available for I Bond purchases through April 30. The inflation-adjusted variable rate lasts six months, and is combined with an I Bond's permanent fixed rate (currently 0.50%) to create an I Bond's composite rate. I Bonds purchased before May 1 will receive the current fixed rate of 0.50%, along with a variable rate of 2.32% for six months, and then 1.40% for six months. Overall, that will provide an average return of about 2.4% over one year. I am recommending buying I Bonds up to the full allocation ($10,000 per person per year) before May 1, to capture that 0.50% fixed rate, which is highly likely to fall when it is reset on May 1. The fixed rate is permanent, lasting until the I Bond is redeemed or matures in 30 years. I'll be writing more about the fixed rate and overall I Bond prospects in an article later this week. The Consumer Price Index for All Urban Consumers increased 0.4% in March on a seasonally adjusted basis, the BLS reported. 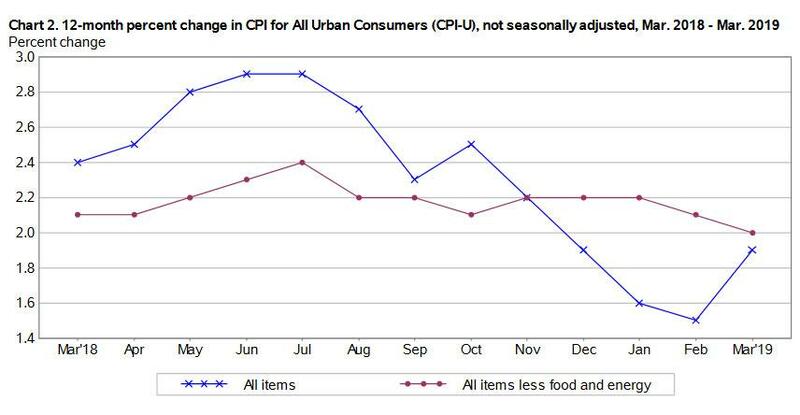 Over the last 12 months, headline inflation increased 1.9%. Both of these numbers were higher than expected. The consensus estimate was 0.3% for March and the 12-month estimate was 1.8%. Core inflation, which removes food and energy, came in at 0.1% for March, below the consensus estimate of 0.2%. 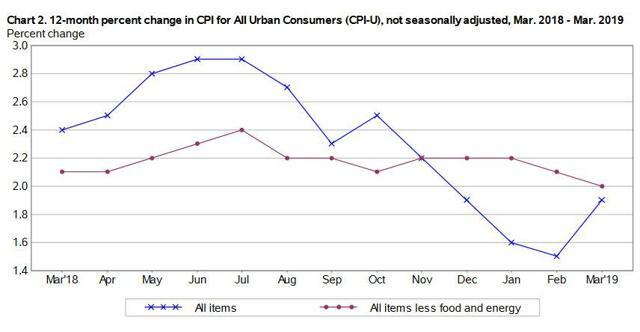 Core inflation is up 2.0% over the last 12 months, also below the estimate of 2.1%. In March, the BLS reported, the energy index increased 3.5%, accounting for almost two-thirds of overall U.S. inflation for the month. The gasoline index was up 6.5% for the month, but remains lower (-0.7%) over the last 12 months. Food prices increased 0.3% in March, and are now up 2.1% over the last year. Shelter prices also increased 0.3%. Balancing off these increases was a sharp 1.9% decline in apparel prices, which are now down 2.2% over the last year. The March index for non-seasonally adjusted inflation of 254.202, up 0.56%, means that principal balances for all Treasury Inflation-Protected Securities will rise 0.56% in May. Here are the new May inflation indexes for all TIPS. The March numbers can be considered a wash. Energy prices drove headline inflation up sharply, but core inflation moderated and came in lower than expectations. This morning's U.S. stock market futures are predicting a slight increase at the opening, meaning this report isn't swaying the markets. At this point, inflation isn't hot or cold enough to say the Federal Reserve's current path of holding short-term interest rates stable.